Last week Monkey boy and Doggie boy attend art camp at heART studio. Monkey boy was in the Real Life Painting( Alexa Meade) class. while Doggie boy did Monochromatic Nature. Teacher Gaz showed the class his own self potrait as a sample and gave them instructions before they were sent of to paint. 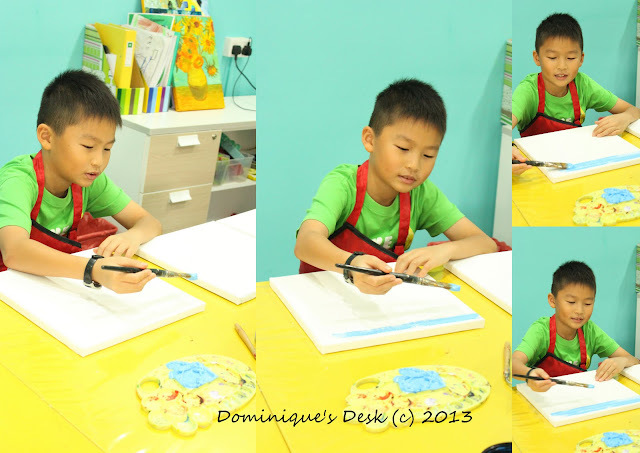 Monkey boy chose light blue for his background and start painting the background for all three canvas. They were told to paint in one direction and fill up the entire canvas with the chosen color. Once Monkey boy has completed the background and it has dried it was time to put on the geometrical shapes that he has chosen. The cut outs against the painted background. Next Teacher Guz made Monkey boy do three different poses in front of his camera. They were captured and printed out before being pasted on the three canvases when the background was dried. On the 2nd day Monkey boy learned how to blend colors and painted the photo which was stuck on the canvas to give it a more 3D appeal. Before long the time was up and he had to leave the final touch up for the third day. His pictures were finally done after doing the touch ups on the third day. Now it was just to dry it fully before it could be taken home. Monkey boy with his completed art work. My little artist was very pleased with his accomplishment. Don’t they look super cool?? Disclaimer: The boys were invited to attend a 3 day art camp at HEarts Studio. All opinions are 100% my own. that was a nice art!